Winners posing along with chief guest Kavinder Gupta and other dignitaries during valedictory function of State Kabaddi Championship. JAMMU, Feb 28: Outplaying District Kathua in the summit clash, Jammu District bagged the twin Kabaddi titles in the 20th Senior State Kabbadi Championship for men and women, organized by J&K Amateur Kabaddi Association at Kabbadi Field, MA Stadium, here today. 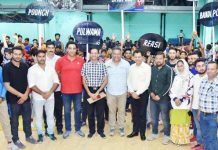 Speaker f J&K Legislative Assembly, Kavinder Gupta was the chief guest on the occasion, while Ranjeet Kalra, Vice Chairman J&K State Sports Council Jammu was the guest of honour. In the men’s final, Jammu defeated Kathua by 9 points, while in the women’s final, Jammu thrashed Kathua by a big margin of 26 points. Earlier, in the first semifinal of men’s section, Jammu beat Barmulla in a close contest by 1 point and in the second semifinal, Kathua drubbed Srinagar by 34 points. In women’s section semifinals, Jammu trounced Srinagar by 37 points and Kathua crushed Barmulla by 30 points. 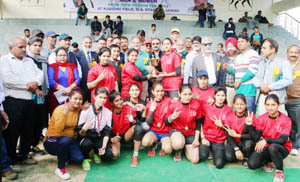 Baramulla and Srinagar won 3rd place in men’s and women’s sections respectively. 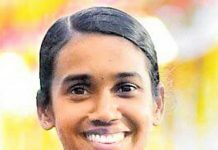 Jhangir Mir of Baramula and Mitali Manhas of Jammu were adjudged as the best players in men’s and women’s sections resepctively. 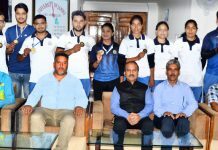 Speaking on the occasion, Kavinder Gupta lauded the efforts of the J&K Amateur Kabbadi Association and announced establishment of flood lights in Kabaddi Stadium at MA Stadium, Jammu. Prominent among others present on the occasion were Abdul Qyoom, Chief Sports Officer, Kuldeep Gupta, CEO of Kabddi Association, Surinder Mohan Gupta, General secretary of the Association, BS Thirthi, Vice President, Sangram Singh, Treasurer, Dinesh Gupta, District Secretary and Anil Modi, Organizing Secretary. 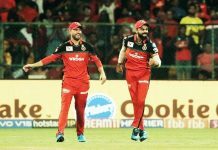 The matches were officiated by Anil Sharma, Ajay Gupta, Ankush Gupta, Dharmjeet Singh, Manik Sharma, Ameen, Ajeet Singh, Shashi Sharma, Yusaf, Sikander, Anuradha, Rakesh Sharma, Mohan Lal, Sanjay Sharma and Rakesh Sharma.